As far as fall holidays go, Thanksgiving often gets overshadowed by Halloween and Christmas which are more valuable to the retail corporations. Thanksgiving, however, isn’t about giving candy or presents. Thanksgiving is about giving thanks and being grateful for the gifts, friends, and family you already have. This year, show your appreciation for your friends and family by hosting a simple but grateful Thanksgiving dinner. To make your gathering extra special, dress up your table to make your guests feel welcome. You don’t have to buy expensive decorations or make elaborate decor to make a cozy Thanksgiving scene. For this stunning, super simple Thanksgiving table centerpiece, all you need is a glass bowl, fresh cranberries, votive candles, and some water. Fill the glass bowl about halfway with water and carefully pour fresh cranberries in. Then add some floating votive candles and light them. You’ll have an elegant centerpiece your guests will love. 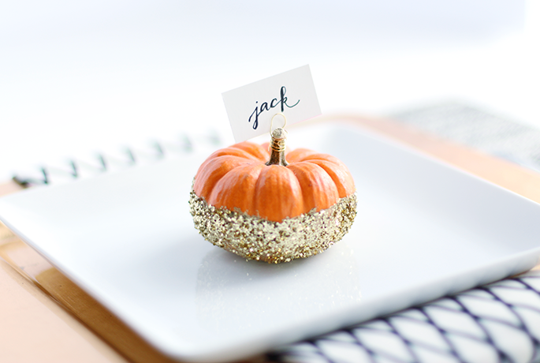 If you have a large gathering this Thanksgiving and want an elegant way to assign seating, make these classy pumpkin place cards. Take some painter’s tape and tape off the top half of the pumpkin. Then use gold craft paint to paint the bottom half of the pumpkin. You may need to use a few coats of craft paint to get the desired amount of color. While the paint is still wet, sprinkle gold glitter over the paint. Finish off the place card with a piece of white cardstock and write your guest’s name on it. You can also cut the cardstock into the shape of a leaf for a more natural look. If you don’t have time to paint or make any crafts, this place card is perfect for you. All you need is some fall-colored cardstock and some sprigs of wheat. Cut the cardstock into even rectangles and then cut two slits on one side of the cardstock. Write your guests’ names on the cardstock and then slide a sprig of wheat through the slits. 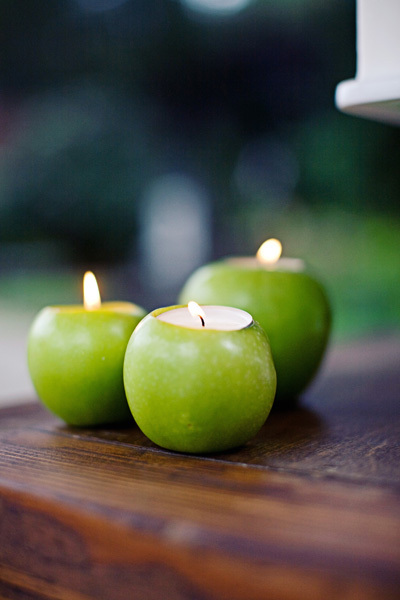 Whether you made your apple pie and have some apples left over or you decided not to make an apple pie at all, use your leftover apples to make a simple and stunning candle display for your Thanksgiving table. Simple cut a hole in the top of the apple, the size of a standard tealight. Scoop out enough of the center of the apple so a tealight will sit level with the edge of the apple. Then put a tealight in the apple and put a row of apple tea light candles down the center of your table or on each place setting. 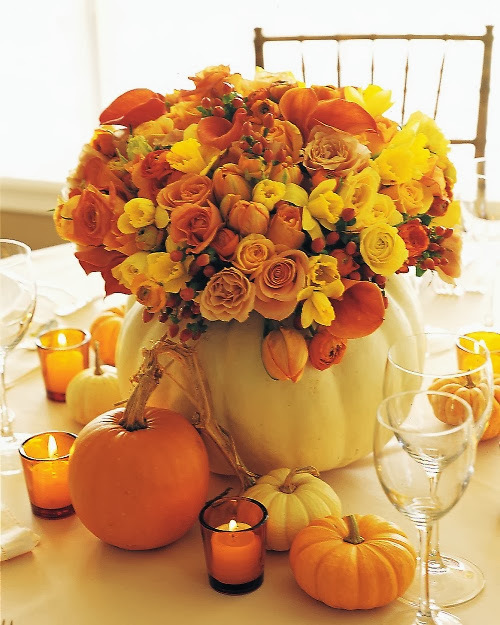 For a colorful, traditional Thanksgiving centerpiece, make a quick and easy pumpkin flower pot. You can use a faux pumpkin to have it last longer or you can use a real pumpkin if you plan on only displaying it for a few days. Cut out the top of the pumpkin and if you’re using a real pumpkin, scoop out the seeds and guts. Use an old can or small vase and put it in the pumpkin. Fill the can or vase with colorful mums and other fall flowers for a simple and tasteful decoration. Written by Kelly Mahan, also writer for homeyou.com, a company that connects homeowners to reliable, affordable and professional contractors for their home improvement projects. Check more on Instagram, Pinterest and Twitter.